Set for its 31st annual running here along the Deschutes River, a place where salmon and steelhead make their annual migration upstream, the Salmon Run Half Marathon celebrates the “homecoming” of several hundred runners who take to the streets of this city every year, overcoming obstacles of their own to run this beautiful route. The race takes place just east of the Cascade Mountains, whose lakes and mountain peaks are a favorite for skiing in winter and hiking in the summer, while the nearby volcanic peaks like Pilot Butte offer stunning vistas of Oregon’s High Desert terrain for miles around. Runners will begin at the Athletic Club of Bend, near Skyline Park. From there, the course unfolds along a combination of roads and riverside trails alongside the Deschutes River, and later through neighborhoods like Old Bend, where you’ll cross the bridge over the river near Drake Park. The race finishes back where you started after a run along Haul Trail, back near the athletic club. Much of the course, thanks to its location along the river, is pancake-flat. The hills that are out on the course (between miles 7 and 10) are gradual and minimal, as the course rises from about 3,688 feet around mile 7 to just over 3,943 feet at its peak around the mile 10 marker. You’ll get to take in gorgeous scenery like the river itself for much of the race, and you’ll run on paved riverside trails framed by wooden fences and greenery. There are some stretches along roadways, but most of the race unfolds along the trails. Thanks to its April running, the race is considered one of the best to kick off your running year here in the Pacific Northwest, and an excellent event for base-building for races later in the year. Nestled along the Deschutes River in central Oregon, roughly 160 miles from Portland, Bend typically sees plenty of cool weather in April, with temperatures that average between the low 30s and the upper 50s, and snow is still very much possible, as the city sees an average of 2 inches during the month. On race day (April 7), the average low is 29ºF and the average high is 56ºF. See the race route map for the Salmon Run Half Marathon here. 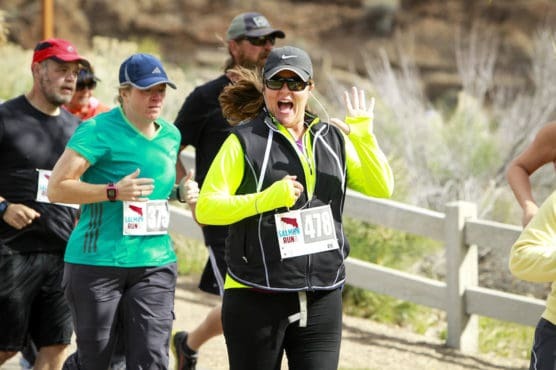 To reserve your spot in the 2019 running of Bend’s Salmon Run Half Marathon, 10K or 5K race, register online at Active.com here. Ever run in the Salmon Run Half Marathon? Share your impressions here, as well as anything you learned about the race that you think other runners/walkers should know.